This excerpt is from my paper Luther And The Jews found Here. Some think that illness and depression caused the “old” Luther to explode in violent harsh outbursts of profanity towards his enemies. It is a convenient explanation which locates the cause of his harsh polemics in unavoidable human frailty: senility, disease, and depression. But, a much more likely explanation is that put forth by Heiko Oberman. Oberman traces Luther’s harsh language as far back as sermon preached in 1515, thus proving the young Luther used the same type of speech as the old Luther. Most importantly, Oberman provides insight rather than psychological condemnation. He points out, “In the total historical context, …Luther’s scatology-permeated language has to be taken seriously as an expression of the painful battle fought body and soul against the Adversary, who threatens both flesh and spirit.”[iv] Luther’s rough language was therefore a weapon to use against the devil. “…[A]ll true Christians stand in a large anti-defamation league and are called upon to combat the God-awful, filthy adversary, using his own weapons and his own strategy: ‘Get lost Satan…”[v] In other words, Luther used scatological language to fight against Satan. Since Luther felt Satan was the mastermind behind works-centered religions (like Judaism), Luther attacks those religions using Satan’s own weapons against him. [i] Roland Bainton, Here I Stand: A Life of Martin Luther (New York: Mentor Books, 1950), 232. [ii] Mark U Edwards, Luther’s Last Battles (Ithaca: Cornell University Press, 1983), 140. [iv] Heiko Oberman, Luther: Man Between God and the Devil (New York: Image Books, 1989), 108-109. [v] Heiko A. Oberman. The Impact of the Reformation. (Michigan: Wm. B. Eerdmans Publishing Co.,1994), 61. [viii] Martin Luther as cited by Eric Gritsch, “The Unrefined Reformer” Christian History, 39 (vol. XII, No. 3), 36. The Postmodern age we now live in poses perhaps the greatest challenge to orthodox Christianity. At least in Luther's time his words were taken seriously. Today, with the philosophy of Relativism permeating society, people are not able to even distinguish the TRUTH because of the cacophony of conflicting and inconsistent messages being transmitted. A good example of this is the frustrating experiences of the author of this Blog - James Swan - in dealing with Roman Catholics on another site. 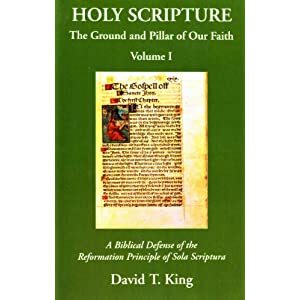 One would think that the 16th century Reformation never even happened, since the same unscriptural abuses and heresies have simply been handed down over the centuries to different people. James Swan no sooner finishes an excellent communication with one person on the RC blog, and then another person pops up with identical false beliefs the other had weeks ago prior to discourse! The battles fought by St Paul in Galatians and elsewhere are simply being repeated in each generation, with only the external packaging being different: the sum and substance of the debates are unchanged and are all somehow associated with the Person and Work of the Son of God, Jesus Christ. While our society may be advanced technologically, theologically this age is as confused and ignorant as ever. People are confused and superstitious, being non-thinkers with respect to anything theological. Since a man's life is so short and eternity so great, one would think people would be more seriously engaged in theological dialogue. Perhaps Luther was correct in seeing Satan behind the masking of our eyes from Christ and His Finished Work? Indeed, that would explain a great deal of the confusion in our Postmodern relativistic world! Scripture is correct in stating that although the sands on the seashore are virtually countless, only the remnant in each generation are saved. Is it only 1 out of 100 sheep? Or less? If anyone should have a blog, it's you. Each comment you leave is packed with insight. Thank you. I haven't done much interacting on Luther with the cyber-Cathoics lately.It is true, I could probably spend all my time in cyber-space dialoging with Roman Catholics about Luther. I have two big files on my computer: one is filled with previous discussions I've had about Luther in the last 5 years or so.It's amazing- they bring him up more than Protestants. It's to the point now, if i do engage a Catholic on Luther- I don't even have to do the work anymore in most cases. I can simply cut-and-paste from my own previous discussions. There really is nothing new under the sun. The other file is filled with web-pages against Luther. every time I come across one, I save it. It's amazing how one web site copies from another- and the same mis-information just moves along. The same Luther quotes pop up- It's to the point where in some cases I know which anti-Luther Roman Catholic book they swiped the quote from. Rarely are the quotes the result of a Roman Catholic sitting down and reading Luther.